There are a many great slide guitar tones. One of the hardest to achieve is a cleanish tone with sustain and a gentle whine. It’s one of those tones you don’t just plug straight into an amp and achieve. It takes a bit of manipulation. The clean sound from most amplifiers is bright with a lot of attack and very little sustain. Lack of sustain doesn’t only sound different, it makes you play differently. It changes a lot of your musical expressions. For instance, the way you might slide from one note into another note without attacking it. One method many guitarists have used to fix this is cranking their amp or using an overdrive pedal. This will result in more sustain, but at a cost. The tone changes considerably. While you gain (pun intended) the ability to add physical expressions, the tonal change augments the aural expression. There are plenty of times where I like overdrive and distortion for slide. But, there are times when nothing will do but a nice clean tone. The benchmark for clean slide guitar playing for me has always been George Harrison and Lowell George. George (both of them) had everything you would want in a slide guitar tone. Clean with sustain and whine. I have typically found this hard to nail pre recording. Maybe because I don’t have George in my name? Pedal compressors just don’t have the same sound as vintage rack compressors. Until now. I can’t tell you how many pedal compressors I’ve been through. Enough to get discouraged. In the studio I use an 1176 compressor to achieve that clean slide tone. Anyone thats used an 1176 knows there is something unique not only in the compression, but the pre amp. Recently, I got called to do a session for actor/musician Ryan Eggold from the tv show The Blacklist. He wrote and directed a film. We were working on the soundtrack. I was asked to play slide. When I showed up to the studio, the producer suggested I try the Origin Effects Slide Rig Compact Deluxe into a Super Reverb. I can’t say I really get along with Super Reverbs. As mentioned earlier, really clean amps can be all attack and no sustain. Blackface Super Reverbs also have a dip in the mids. This also doesn’t compliment slide guitar in my opinion. I was completely shocked when I plugged in the slide rig. It brought the Super Reverb to life. I had all the sustain I could want. All the sustain I could ever need. The Slide Rig was really quiet for a compressor too. I also really loved the flavor of the pre amp. This was the pedal compressor I have been dreaming of for slide guitar. It brought out all of the nuance in my playing. I knew I had to have one immediately. When playing clean into an amp there can also be a disconnect between the high and low strings of a guitar. Because there is such quick attack and little sustain, the low strings don’t tend to cut. This is frustrating when you want to play a part that sounds throaty. Using a Slide Rig can reunite these the two lost souls together…The High and the Low. I can get as much clarity and punch on the A string as I can on the high E. I’ve never played with a pedal that’s allowed me to have such a close relationship with slide on my lower strings. We’ve been spending a lot of time together these days. Turns out we have a lot in common. I think we might even get engaged. Gluing all the registers of the guitar together wasn’t something just any compressor would fix. I’ve tried. The Slide Rig Compact Deluxe has changed my playing. There were things I knew I could play. But, they just weren’t coming through. It’s allowed my voice to come through clearly. Often we talk about tone on pedals. We don’t often discuss how a certain piece of gear changes our playing. How it could allow us to express ourselves more freely. As a slide guitarist, this is one of my most important pieces of gear. 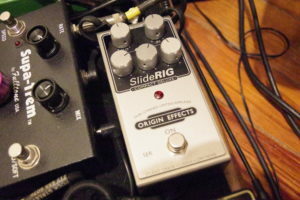 The Slide Rig is essentially two 1176 compressors in a pedal. It allows you to chain both 1176’s together. This is a trick the great slide guitarist Lowell George used to do in the studio. It’s how he got his signature clean slide tone. Lets watch a video with the Slide Rig Compact Deluxe in action. For this composition I was using an American Standard Stratocaster into the Slide Rig into a UAD Apollo using the Fuchs Train II amp sim. The Fuchs can get a nice clean sound with flattering mids. It’s a really nice sounding amp sim. As mentioned earlier I’m using a glass medicine bottle slide. I put some red felt inside to prevent it from slipping off my finger. INterrested in learning more about Slide guitar playing or tone? Feel reach out to me and ask about Slide Guitar Lessons.